Team Slovenia ima novo Steem front-end spletno stran. Trenutno je možen ogled objav, ki vsebujejo oznako (#tag) #teamslovenia. Objave, ki so bile napisane v zadnjih 24-ih urah (do 100 objav). Steem-js API podpira do največ 100 objav naenkrat. Objave, ki so "trending" (prvih 25 objav). Objave ki so "Hot" (prvih 25 objav). Objave, ki imajo največ komentarjev (prvih 25 objav). Vseh izplačilih objav z oznako #teamslovenia. Enota je STU ($). Številu vseh komentarjev pod objavami z oznako #teamslovenia. Številu vseh glasov pod objavami z oznako #teamslovenia. Številu članov TeamSlovenia. Kot člani se štejejo vsi, ki jim sledi @teamslovenia. Če na seznamu kdo manjka, to omenite v komentarju. Branje objav komentiranje, glasovanje na strani prek SteemConnecta. Trenutno je branje objav možno prek steemit.com. Samostojna domena za spletno stran. 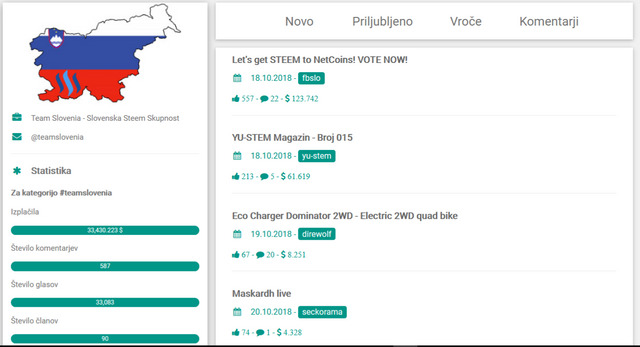 I want to create Slovenian front-end website for STEEM blockchain. Slovenian community have new front end website. It's possible to see posts with tag #teamslovenia. Posts posted in last 24 hours (up to 100 posts). Steem-js API call allows only up to 100 posts at once. Trending posts (top 25 posts). Hot posts (top 25 posts). Posts with most comments (top 25 posts). Total payout for posts with tag #teamslovenia. Unit is STU ($). Total number of comments under posts with tag #teamslovenia. Total number of votes under posts with tag#teamslovenia. Number of members of Team Slovenia. Members are accounts followed by @teamslovenia. Reading posts, voting, commenting on website (with SteemConnect). Currently, you are redirected to steemit.com. This project fulfilled the promise from my witness thread. If you need website like this for your local community, contact me (discord is the best way). If you think that this project adds some value to Steem, please consider voting for my witness. Thank you! Please read my Witness Thread and support me by voting @fbslo for witness. Glad to see new input into the Steem economy. @fbslo, Good to hear about this Front End and for sure these kind of Initiatives and Developments are vital in aspect of Community Development and Community Collaboration. And that's why Steem becoming so unique because so many developments are going on and the best aspect is Communities can develop tools as per their community Interest and that's amazing aspect. You got a 27.99% upvote from @emperorofnaps courtesy of @fbslo! Your UA account score is currently 5.243 which ranks you at #806 across all Steem accounts. Your rank has improved 15 places in the last three days (old rank 821). In our last Algorithmic Curation Round, consisting of 254 contributions, your post is ranked at #40.